We invited GK VanPatter to talk about Design 3.0. GK is an innovation architect and visionary thinker who co-founded Humantific and NextDesign Leadership Institute. 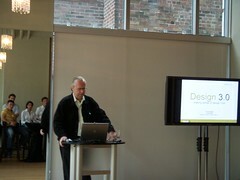 GK presented the longer version of Design 3.0 at Mix. GK was the first of the three speakers of the evening. He said it was brave of Microsoft to invite him speaking in the Expression tour since his talk was not related to technology but focusing on design behaviors. Design 3.0 is about cross-discipline collaboration and managing diverse creative groups. I think it's a great way to open the design conversation that we are trying to create at these events. It's not just about technology! The model we use to create UX at Microsoft has three key components: craft, platform, and tools. The `Craft`piece is the act of conceptual design using non-technical design skills (e.g. analytical and communication skills), so it's independent of the choice of technology. Next stop we had Danny Riddell, president of Metaliq to demonstrate the Silverlight application, Top Banana, created using Expression Studio for the front-end UI and Visual Studio for the backend logic. Top Banana allows you to edit your video clips right in web browser and preview them at the same time. I especially like the intuitive dragging interaction to expand the video clip. The application can run in full screen blurring the line between desktop and web applications. It utilizes the true HD and high performance provided by Silverlight, so users can preview many video clips at the same time. Danny showed playing 7 video clips at the same time with no delay. What amazes me is that with all the rich interactions and HD videos, the app is less than 50K, and took them 3 week to built. Danny also talk about the designer-developer workflow they experienced building the application, which I'll talk more in detail in my next post. The final speaker was our Senior Expression Product Manager, Rini Gahir. He gave an overview of Microsoft UX Platform and how the tools can work together to support building compelling UX on web and desktop. In short, there is a spectrum of richness for UX from web to desktop. On one end, you have standards-based websites. Although with limited interactibility, these websites can reach millions of users and have great accessibility. Expression Web is designed to build these type of websites, and it integrates well with Visual Studio to develop dynamic websites. On the opposite end of the spectrum, you have Windows desktop applications (DA for short). DAs provide ultimate rich UX such as true 3D, animation, multimedia, and vector graphics, and they run locally. Then, there's something in the middle, called Rich Interactive/Internet Applications (RIA). RIA run cross platform and browser and have desktop like interactions. We provide Silverlight as the platform to run RIA. Expression Design, Blend, and Visual Studio are tools for creating desktop applications and RIAs. Expression Media is a digital asset management tool which can be used in all your design projects. I'll talk about the workflow among these tools in the next post. We have two demo pods set up for each event to let the attendees have a close look at the tools and some real-world applications created using Expression Studio on top of the platform. For both Toronto and Montreal, our partner Momentum demonstrated their desktop application for SickKids foundation. It's such a heart-felt application illustrating very lovely kids with terrible disease that are in need of help. The whole app does such a good job of story-telling, Robert de Korte (Vice President of Momentum) told me that designers shed a lot of tear while working on the project. I demoed a number of WPF (Windows Presentation Foundation) examples: British Library Turning Page, Next Generation of retail experience - OTTO, and a few Silverlight apps such as Silvelight Airline, FOX Movie Player, and Silverlight Pad. 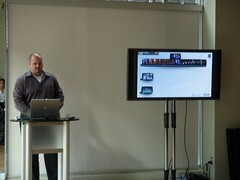 Paul showcased the workflow between designers and developers using Expression Blend and Visual Studio. We'll post the resource for the demos shortly. I had a great time on the tour, and I hope you had a great time experiencing Expression and mingling with your peers at the event as well. 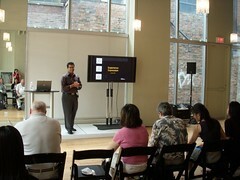 Feel free to contact us and let us know your feedback on the event and the Expression Studio. Have a wonderful weekend! Stay tuned for Part II. It was great to see a good mix of designers, developers and hybrids out at the events. Great interest and excellent feedback. Looking forward to working with a lot of these guys in the near future. Sorry we missed you! 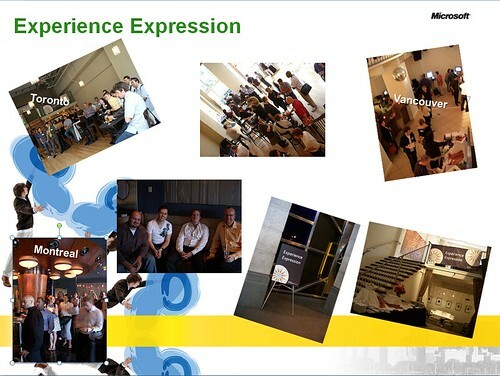 Rini is planning to do another Expression Tour this fall in a larger scale. We are definitely looking forward to seeing you there. Thanks for coming out to EnergizeIT!